The American team was baffled at first. How do we restrict ourselves while reaching out to the Iranians directly? We decided to confine ourselves to a single room (studio, bathroom, etc.) 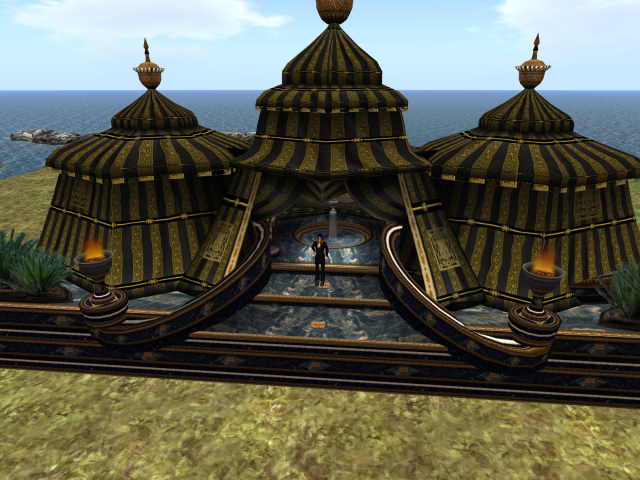 for 24 hours (Sundown/ Sundown) while extending our presence in the online virtual world of Second Life. It is our hope to meet with our Iranian counterparts and dialogue while we are also likewise confined to a tent in Second Life. This is the pressure we impose upon ourselves, in an attempt to understand, however slightly, in solidarity with our Iranian counterparts. Your Night/My Day,Your Day/My Night is a collaborative project curated by Morehshin Allahyari and Eden Ünlüata which excavates the process of the cultural exchange – or lack thereof – between Iran and the United States. The works generated through this project will highlight the dysfunctional nature of cultural exchange between these two cultures. Presently, there are no direct diplomatic, trade, official artistic or intellectual contacts between the US and Iran. All such communication and exchanges take place through third parties which further complicates the relationship and feeds the distrust while making both sides vulnerable to the agendas of third parties. For this project, the process of art making is based on a series of invitations from the curators Morehshin Allahyari and Eden Ünlüata, called Inspiration Notes featuring 11 topics broadly interpreted in multiple cultures. These topics include: tea and coffee, games, shoes, hands, fruits, stickers, fortune telling/future telling, private and public shared lives, time, modern media – TV/Internet and visiting. Through the Inspiration Notes, teams in each country will be asked to write instructions in their native language for the opposite team to perform and document on a given topic. However, before the opposite team receives them, the instructions will travel through an artist/ editor from Turkey who will put them through the Google Translator (Farsi>Turkish>English / English>Turkish>Farsi) and edit them as he/she sees fit – For further information and details please see ‘process’ document. Using this 11-part series, we are not only seeking to decipher and depict the nature of the dysfunctional dialogue between Iranian and American cultures, but also seeking to reveal paths through art that may lead to a better understanding between the two cultures.